Identify the location of this service station? Hint: Many years earlier, three Vanderbilt Cup Races passed this location. The Jondol Service was located at the northwest corner of Jericho Turnpike and Marcellus Road in Mineola. The business was owned by Guy Roese of Mineola.This section of Jericho Turnpike was part of the courses for the 1904, 1905 and 1906 Vanderbilt Cup Races. What is at the location today? The building is still standing today! It is Randi's Cleaners. Identify the automobiles in the Mystery Foto? From Walt Gosden: Above photo from right to left : 1931 Plymouth model PA sedan, Oldsmobile 4 door hardtop (modern transportation in 1970 not collectible), 1953 or 1954 Chevy 2-door sedan (modern everyday used car driver in 1970) and a Chevy pickup (used everyday driver for the era). What was the year of the Mystery Foto? Provide a rationale. 1970. Rationale: The Oldsmobile in the Mystery Foto. Kudos question: Link an object in the Mystery Foto with a Motor Parkway building. 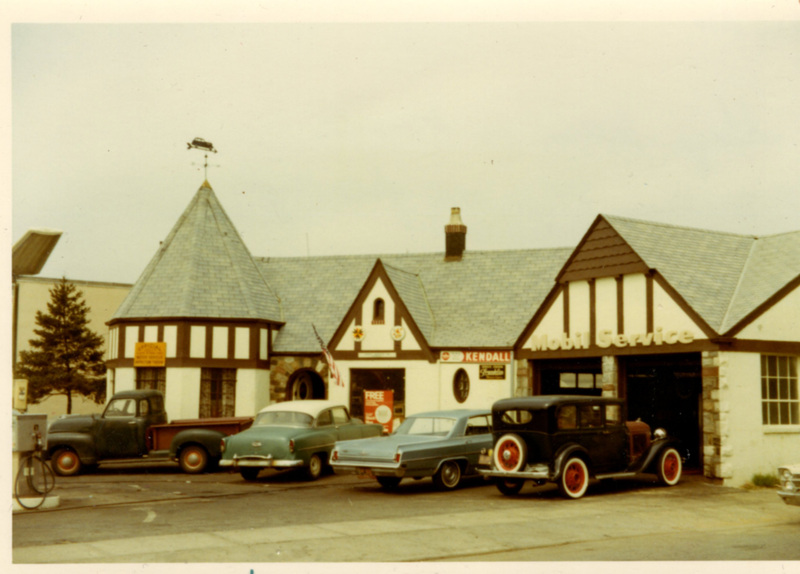 The automobile weathervane on the service station is similar to the automobile weather vane on the Long Island Motor Parkway's General Manager's Building in Garden City. The weathervane is currently on top of Walt Gosden's garage in Floral Park. 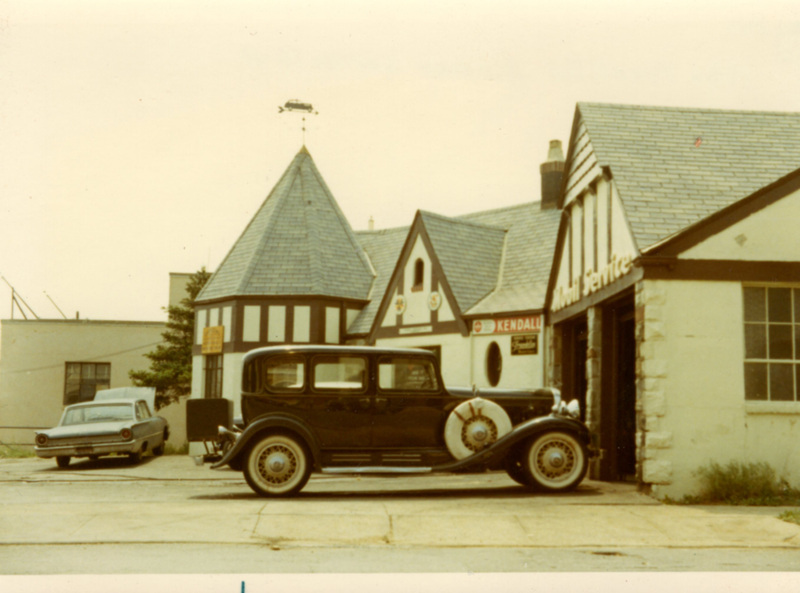 Congrats to Andy, Robert Huffmann, Bob, Brian McHale, Casey DeNicola, Mark Lanese and Al Velocci for identifying the correct location of the Mystery Foto as Jericho Turnpike in Mineola. 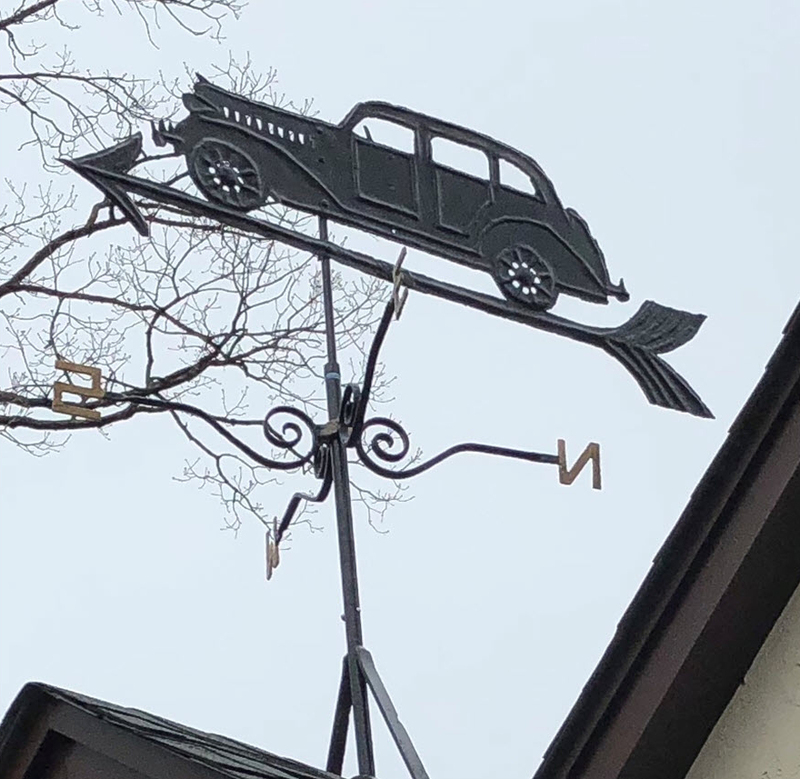 Kudos to Art K.,Sam Berliner III, Frank Femenias, George Philippides for linking the Jondol weathervane to the automobile weathervane that was on top of the Motor Parkway General Manager's office building in Garden City. A shout-out to Robert Hoffmann, George Philippides and Mark Lanese for beta-testing posting images with their comments. They look great! Walt Gosden: Front of my 1931 Plymouth PA four cylinder sedan. Hood in red primer. Walt Gosden: Right to left : 1931 Plymouth model PA sedan, Oldsmobile 4 door hardtop ( modern transportation in 1970 not collectible), 1953 or 1954 Chevy 2-door sedan (modern everyday used car driver in 1970) and a Chevy pickup (used everyday driver for the era). Randi's Cleaners on the corner of Jericho Turnpike and Marcellus Road in Mineola. Walt Gosden: The figure of the car, arrow and the N S E W section are original. The rest I had to make up or replace as it was all frozen solid with rust and probably hadn't turned in 40+ years. Every few years I go up there and oil or grease the shaft I replaced to keep it functioning. It seems that car seems to be some kind of Chrysler product either a Dodge or DeSoto circa 1935. which I believe is close to the date of when the station was built. The building still stands on Jericho turnpike, across from Chaminade School in Mineola. The roof top automobile wind directional hints of motor parkway. I can identify most of the vehicles. In the first picture, a ‘54 Chevy, a ‘63 Olds 88, and, barely visible, the headlights of a ‘65 Plymouth Fury. In the second picture, a ‘63 Ford Galaxie. The truck looks like a Chevy, ‘47-‘54. The ‘30s car has me stumped. 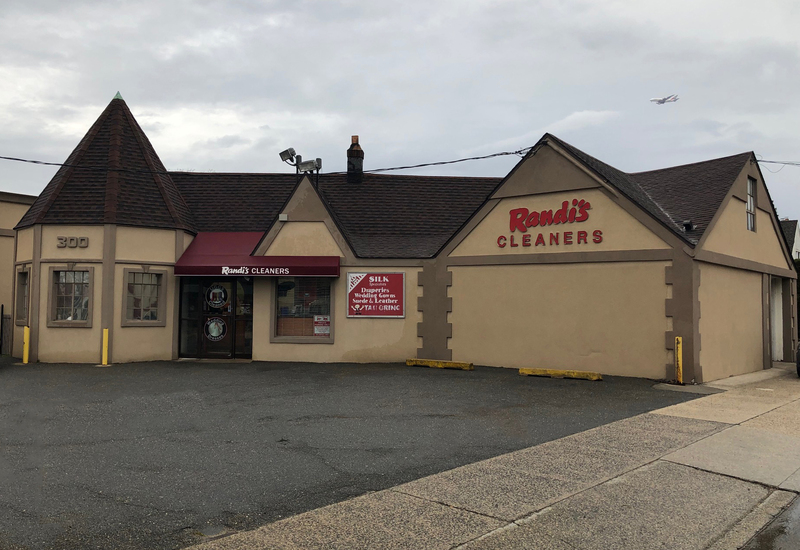 Randi Drive In Cleaners 300 Jericho Tpke Mineola, Nothside of Jericho Tpke at Marcellus Ave. This one I think I found the answer: Weathervane on top of building used to be on the General Manager’s office building in Garden City. Jericho Turnpike Mineola. A Dry Cleaner, Mid 50’s Chevy P/U, 54 Chevy?, 61 Olds?, 1930’s Ford?, 60 Ford, Headlights of a 63 Caddy? Early 1960’s. That’s all I’ve got. There was/is a bldg like this on the south east corner of Denton Ave. and Jericho Tpk. in Garden city park.Not sure this photo is it.Great building though wherever it is.Hope it still exist.The autos from the left are early 50s Chev/GMC pick up,1963 Oldsmobile,I think a late 20s Lincoln,not sure of this one and in lower right corner,a 1965/66 Plymouth.In the other photo of old car w/sidemount car in background is a 1961 Ford. The Plymouth would date this from the mid 60s? These vehicles are wide in years, a special (Mobil) service station. I suspect Floral Park somewhere as Walt is the town historian (I cheated, but still could be wrong). Forget about Jericho Tpke and Tulip with the RR. Tulip and Carnation, No! that building’s been there since 1908. This is somewhere deep inside the village during early 60’s, the light blue car at center is mid 60’s. The color photography quality is similar to that time, but where? OK, corner of Plainfield and Tulip. I have no better guess, I’m stumped! Looking forward to the answers. Hurry up! I missed this image growing up. I was too young to visit this site as it appears. Thank you all for sharing this experience and making it possible for all to see! By the way, that wind vane on top was the one, that was once located atop of the Motor Parkway’s Superintendant’s house on Vanderbilt Court, still standing! I can only answer the Kudos question. 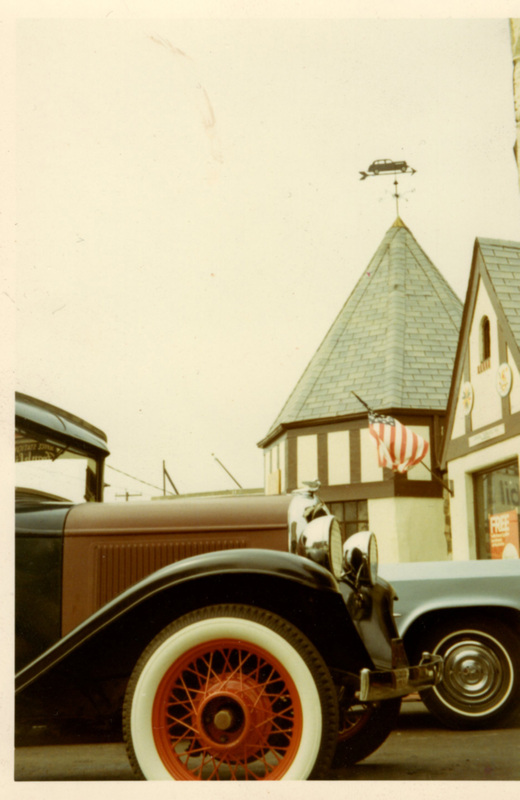 The weather vane on top of the building, in the image of a car and running dog, was originally on the Motor Parkway’s General Manager’s office in Garden City on Vanderbilt Court. As kids we used to ride our bikes up and down the remnants of the Clinton Road Motor Parkway Bridge embankment then in to Vanderbilt Court by the old lodge and that building. Didn’t have time this weekend to figure this one out, looks like sometime in the early 60’s. The weather vane at the top of the station is similar to the one on top of the LIMP Manager’s office. I knew that I recognized the distinct architecture of this building when I first viewed your post Friday night. It just struck me Monday morning. The location is corner of Jericho Tpke and Marcellus Rd. in Mineola. Still there, but now it is Randi’s Cleaners. Best guess for date of picture is around 1963. Looks like a LIMP annual use plate on front bumper of car. Hi Howard, The building is located at the northwest corner of Marcellus Rd. and Jericho Tpke. in Mineola. The address is 300 Jericho Tpke. and today it occupied by Randi’s Cleaners who have there since the gas station closed and it still looks the same. The photo was probably taken in the 1970’s. What the building has in common with the Motor Parkway office building is the automobile wind Both of them are gone now. The one that was on the Parkway office was left in place after the building was sold. A Parkway enthusiast bought it and still has it. Perhaps he will come forward and give us the details. Al. Not sure if I included the weather vane is from the Motor Parkway Manager’s house on Vanderbilt Court in Garden City. Joe, I totally agree. Never meant to imply they were the same. The Motor Parkway vane is older with a different automobile model. Thanks to all who commented, makes me so glad it stirred up some memories of 50 years ago. Very good guess work on those of you who weren’t there in that era. Guy Roese was the fellow who got me into collecting classic pre world war II era luxury cars. We spent some very late nights working on some wonderful machinery there - lots of stories about that as well , many of which would evoke the response ” I can’t believe you guys did that - REALLY - SERIOUSLY! GEEZ” Makes me reflect and think that too at this stage in life! (Well sort of.) Normal stuff then that would be viewed today as wild and totally crazy. A Sam III Story: Guy Roese lived about 2 blocks north of what was then known as Nassau Hospital in Mineola at 180 Horton Highway. Guy always owned interesting cars , everything from a unrestored 1934 Chevrolet roadster ( that was a gift to him back in the 1950s) to a 1940 Cadillac series 75 formal sedan he found in Glen Cove , that was also a mostly original car and an unrestored 1931 Franklin Pirate touring car. His modern car was a black 1955 Chevy convertible. Anyway, Guy would often have to put a new battery in the car he bought and the old one would go to the curb on trash day. This was in an era before recycling had even been thought of and the fellows on the trash trucks in Mineola loved this as they could pick up stuff like a car battery and take it to a place and get a few $ for their effort. One evening Sam, Guy and I were standing in Guy’s driveway and the next day would be trash day and Guy had put a battery out. He commented on the fierce rivalry among the fellows on the trash truck to grab the battery as they saw $ sitting there at the curb. I will never forget Guy stating ” wow, I would love to attach that battery to a post that went into the ground and when they scrambled to get it/pick it up it wouldn’t budge.” We all laughed and Sam you made it even better when you said ” Well if you can do that I will dig the hole to bury the post in so they don’t see it , and that battery would indeed be a puzzle for them to get up off the ground and into the truck” ! We all had a really good laugh over that comment and I still remember it to this day. SO Sam there you are, you asked to rub it in, well you really rubbed it in that long ago evening and made us laugh at your clever idea! Thanks for the memory! Sam, I cherish those days and memories and the friendships that developed. Yes, there are a lot more stories to be told. With permission, that weather vane on the station was cut down by me with a hand saw in the middle of a very windy and extremely cold November night .